This is a follow-up to last week’s “#emailgeeks on Twitter” post. One thing that I noticed when browsing through the community is that women seem to be significantly underrepresented. They also tend to have fewer followers. To encourage networking, here is another interactive map just with #emailgeek women. Speaking of underrepresentation, what female:male disproportion are we talking about? My guess would be that there are nearly twice as many male email geeks on Twitter than there are female ones. Interestingly, that’s quite the opposite of what I experienced at conferences (about 60% female attendees) and webinars (about 65% female registrants) in Germany. The 1:2 ratio has to be treated with caution though. Afaik, Twitter itself does not report gender data, but user names. By pulling out the first names from user names and then matching them against a firstname-to-gender database, one can try to append the missing gender information. However, several accounts have only handles and no additional real names. 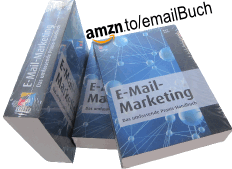 Among those are of course corporate accounts, but also a huge number email geeks. This results in a big block of missing values (NA). In addition, first names are partly associated with both genders, and their usage varies over time. So the gender classification might be wrong. 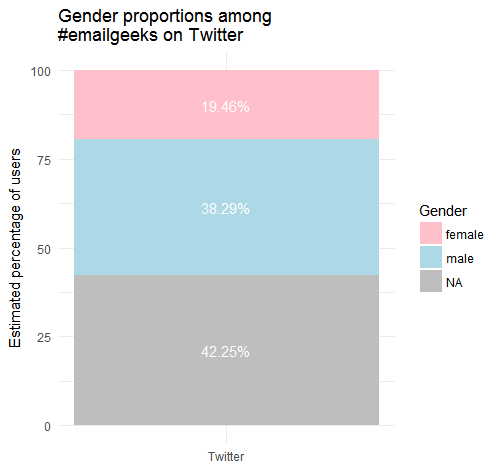 Why could women be underrepresented in the #emailgeek network? Home improvement king Tim Taylor might argue that it’s called “e-male” for a reason, namely because of its power. 😉 However, it is more reasonable to assume that maybe men have a slightly higher affinity for Twitter, or that women are less likely to set their user names (=> NA), or that the network is just far from being complete on the female side for other reasons. Feel free to suggest corrections and the names I forgot in the comments. Meanwhile, I suggest you to follow these emailgeeks within the women’s network: Justine Jordan, Anna Yeaman, Kath Pay, Jaina Mistry, Becs Rivett-Kemm, Laura Atkins, Anne Tomlin, Rut Dawson, Jeanne Jennings, Sharon Jennings, Samantha Iodice, Tamara Gielen, Ros Hodgekiss, Lauren Smith, Jen Capstraw, Annett Forcier, Erin King, Nicole Merlin, Stephanie Miller, Karen Talavera, Erika Westphal, Mia Papanicolaou, Alex Skelly, to name just a few. There is also a Twitter list f_emailgeeks♀, which you can follow easily. This entry was posted in english and tagged twitter. Bookmark the permalink.